Sony has unveiled an upgrade to its entry-level DSLT offering, in the form of the a37 - also known as the Alpha 37 - which will replace the Sony a35 camera. The Alpha a37 uses Sony's translucent mirror technology, which incorporates a fixed, translucent mirror, instead of the conventional device found on DSLR cameras. This means that the camera can offer continuous autofocusing in live view and video modes and a high-speed continuous shooting rate. Featuring a 16.1 million pixel Exmor APS-C HD CMOS sensor, the same as that found in the also newly announced Sony NEX-F3, the camera incorporates a 15-point autofocus system. Using phase detection, as opposed the traditional contrast detection systems found on conventional DSLRs, Sony claims that the camera can provide more accurate and reliable continuous autofocusing. The Sony a37 includes Sony's third generation Bionz processor, which was first seen in the a77 - Sony's flagship camera model. Consequently, the Sony Alpha 37 also boasts a sensitivity range of ISO 100-16,000 and Full HD video recording. A tilting rear LCD screen is included, along with a "Tru-Finder" electronic viewfinder, which offers a 100 per cent field of view. The aesthetics of the camera remains largely similar to the Sony a33, but ergonomics have been very slightly reworked, with a small change to the grip and button layouts. 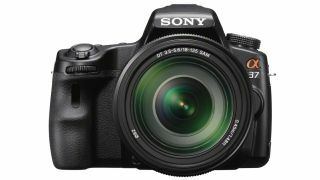 The Sony a37 price is expected to be around £530 in the UK and $599 in the US, and will be available from the end of May.